Today’s bird is it one that is fairly common throughout the forests of Madagascar, but which I haven’t been able to get a good picture until now: the Madagascar magpie-robin. Although these birds occur in rainforest as well as deciduous forests of the type we had here in Anjajavy, the density of growth in the rain forest and the lack of light can make them hard to see. But here in the deciduous forest, most of the leaves have fallen from the trees, letting lots of sun through. Plus, we have a reforestation nursery right next to our lodge, full of native species’ seedlings. The Madagascar magpie-robins seem to love the low growth, where they hop around the dusty, leaf-strewn frown in search of spiders and insects. Male and female Madagascar magpie robins have distinct coloration. The males, with their black upper body and white bellies, are easier to identify from a distance. That I prefer the coloration of the female, which has wonderfully subtle rainbow of browns, from rusty orange-brown to bluish gray-brown. back in the early 2000 I went through a phase of dying all my clothes with black walnut husks, and every piece would turn out a different shade of brown depending on the fabric type and previous color. 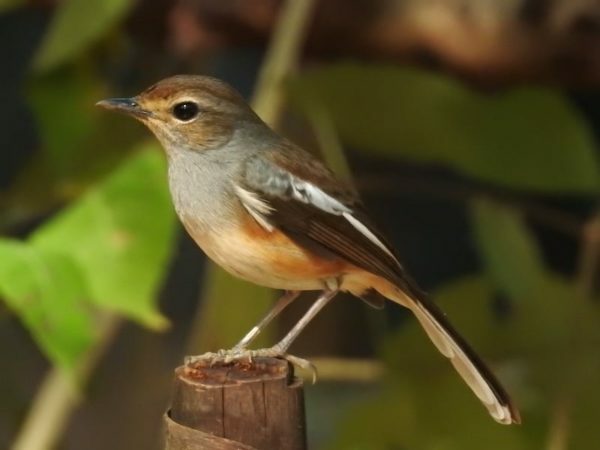 The female Madagascar magpie-robin makes me want to give a go of dying everything brown again, because she proves just how not-boring brown can be. 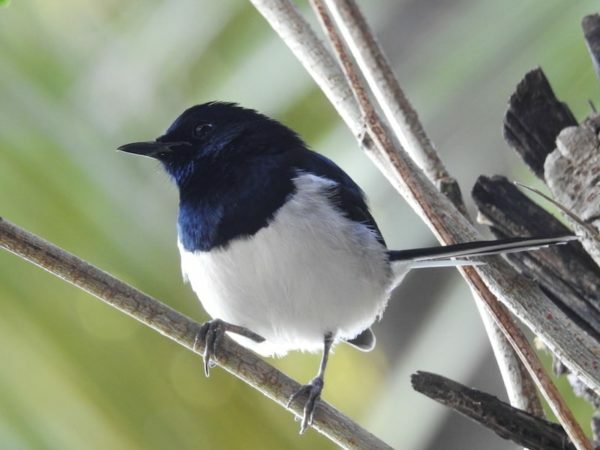 Why are Madagascar magpie-robins called “magpie-robins”? My guess is that some Europeans came up with the name because they were reminded of birds back home. The male’s black-and-white coloring is reminiscent of the Eurasian magpie‘s black-and-white pattern, and the female looks a bit like the brown-and-rust European robin if you squint. Hmmm, I thought I had answered this, but now I don't see an answer here. Mysterious! I no longer have any of the clothes I dyed with walnuts. It was a looong time ago. It might even have been the late 90s. It was pretty straightforward, just boiling water and walnut husks to make the dye (maybe one part husks to two parts water?). Then I strained it through a sieve a couple times and then through an old T-shirt to remove all the tiny crumbly bits of walnut husk from the liquid. Otherwise, they could stick to the fabric and cause uneven dying. (If that was the effect I wanted, then I wasn't so careful with the straining.) It didn't really need a fixative, though you could add one (iron, I think) if you wanted to make the brown very dark. On white cotton, using this without much dilution would produce a nice medium-chocolate brown. But I played around with poly blends, light colors, and whatever I could get my hands on.